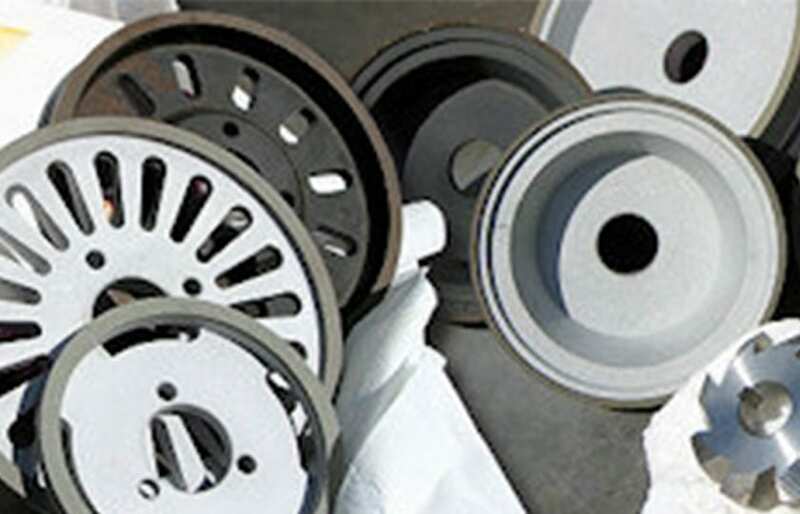 The choice of the right diamond grinding wheel must be determined according to the customer’s specific application. The decisive factor is the optimum interaction between wheel dimensions, grain size, bond and concentration. Our employees with their many years of experience will be pleased to advise you by telephone or at your site regarding a high-quality and cost-effective design of a diamond grinding wheel for your process. More than half of all grinding tasks can be accomplished with synthetic resin bonded diamond grinding wheels. The synthetic resin bond offers countless bond variations and very high stock removal rates. Metal bonds are characterised by very high grain retention forces. For the continuous self-sharpening of blunted diamond tips, large infeed forces are required which produce increased heat generation. Metal bonds should therefore always be used for wet grinding. Dry grinding is possible with small contact surfaces and low cutting depth. (Profile grinding on PETEWE, Studer, Hommel and Loewe). With electroplated nickel bonding, usually only one grain layer of diamond is held (2- or 3-layer is conditionally possible). The electroplated S-bond with diamond as abrasive is particularly suitable for processing less hard, but wearing materials such as graphite, mineral- or glass-fibre-reinforced plastics and the like.